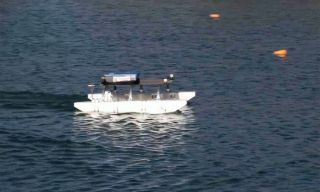 A University of Arizona engineer has built an autonomous, floating, self-propelling robot meant to gather data on lakes on Earth and in space. He has tested the watercraft in a lake near Tucson, Ariz. This small, Styrofoam-hulled watercraft has a mind of its own. It's a floating robot made to land on a lake, propel itself around and gather data about the water and atmosphere as it goes. Its creator, an engineer named Wolfgang Fink now at the University of Arizona, built it for future lake-landing missions to one of Saturn's moons, Titan. It could also be used for science and military missions on Earth, according to UANews. Fink presented the watercraft, called the Tucson Explorer II or TEX II, March 8 at the IEEE Aerospace Conference in Big Sky, Mont. A YouTube video posted March 13 shows two researchers putting TEX II, which weighs about 100 pounds, into what looks like a small lake. (The video doesn't say where they are, but it may be showing tests that Fink and a student conducted near Tucson, Ariz.) In the video, the robot turns some circles and navigates on the lake's surface. TEX II can carry 150 pounds' worth of sensing equipment, and so far, Fink has tried equipping it with cameras and sonar. TEX II can be controlled from anywhere around the world using an Internet connection. Fink is working on making the craft more autonomous. Ultimately, he wants to create data-gathering robots that have a sense of curiosity. They should want to investigate certain places, learn from what they find and use that information to decide what to explore next. On Earth, an improved version of TEX II could help officials survey the cleanup of dangerously polluted water in munitions dumps and mines, Fink told UANews. The robot also could help ocean scientists gather data about currents and pollution. For a mission to Titan, Saturn's largest moon, NASA is interested in rovers that can land on liquid rather than on solid ground, because Titan's surface is covered in lakes of liquid ethane and methane. The agency already has one proposal it's considering. The Titan Mare Explorer would land a nuclear-powered floating robot on Titan's seas. Fink is especially interested in an idea he came up with in 2009, for which he won a NASA Board Award: It envisions planetary exploration being carried out by autonomous robots that cooperate through tiers of commands. TEX II would be a foot soldier, exploring areas of a lake surface that a robotic blimp overhead had scanned and found interesting.